the front car,supporting and driving wheels turn around the king pin,in the condition of the car moving,undertake variable impact load.So steering knuckle requires not only reliable strength,and must ensure its high machining accuracy.Its geometry is complicated,so the machining sections are more,the machining precision of high and low will affect the vehicle running accuracy.Based on the forging analysis of two different forging process of steering knuckle,discussing the influence of parting ways,distribution of allowance on machining processing. 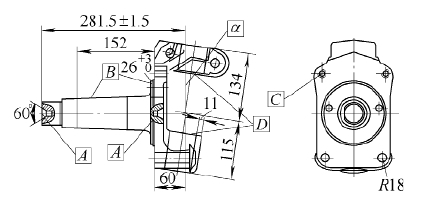 Shape of steering knuckle is complex,gathering structure characteristics of four types of parts(shaft,hole,disc,fork frame), mainly consists of supporting shaft,flange,fork frame.The structure shape of supporting shaft is stepped shaft,its structure characteristics is rotor made up of coaxial cylinder, cone, thread surface,and a shaft shoulder,perpendicular to the axis line of transition fillet and end face; Flange part includes flange surface, connecting bolt hole and threaded hole;Fork is formed of fork frame structure made up of steering knuckle upper&lower ear,and flange surface. Main machining process of steering knuckle:milling shaft end face, drilling central hole on both ends-rough machining flange end face and support shaft journal--half precision machining and machining support shaft neck,rounded corners,flange,car end thread--drilling,tapping flange surface thread--coarse and fine milling inside and outside face of upper and lower earrings--rough diamonds,fine boring king pin hole--surface hardening (as needed),fine grinding large and small bearing neck and rounded corners--make engraved logo--inspection and warehousing. There are two kinds of forging processes of steering knuckle: horizontal parting (parting plane) and vertical parting (vertical parting).Horizontal parting is a forging process that using forging center plane as parting face,because the difference of section face between support shaft parts and flange&fork frame is large .It will make blank producing rather complex for rational allocation of billet.Even so,large flash will still exsit on the connection area of a supporting shaft and flange,and along the axial direction to reduce gradually,until the end to reach normal width,material utilization rate of this forging process is low.Vertical parting way is based on the center of the flange plane,we can use closed die forging process during pre forging,then finish forging forming and excrete excess metal. Because forgings production mode is different,there may produce different influences on the machining of steering knuckle when designing parting face,machining allowance distribution and fault and thickness tolerance.Especially in the milling shaft end face drilling centre hole,machine,ground support shaft neck (see figure 1 machining of section A and B) and the flange end face,machining thread hole connected by steering knuckle arm and brake in the flange,and the machining fork on end face and king pin hole, etc (see figure 1,machining of C, D sections),therefore in the selection of process design,fixture locating surface,we must adopt corresponding countermeasures according to the different forging production methods. When using horizontal parting dies to forge steering knuckle,the parting surface is usually selected in the biggest section,as shown in figure 2 we can see, A - A is forging parting surface,and the forging direction perpendicular to the flat parting surface,namely along the direction B - B.In this way forgings will be formed by upper and lower die forging.Machining allowance is evenly distributed in the support shaft,flange end face and up and down fork end face.Draft angle of forgings along the direction of forging,namely the direction of the B-B,generally is 5 °~ 7 °;In the forging process,affected by the forging temperature and the forging force factors,upper and lower die can't completely rely on,so will form thickness difference in the forging direction,usually tolerance is +/-1mm. 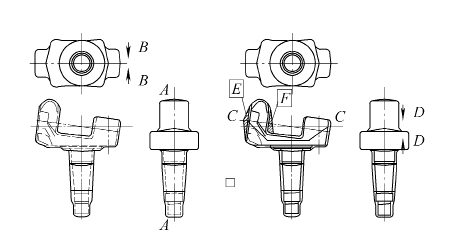 However,the parting face of vertical forging is selected in the perpendicular to the support shaft and pass through the center of the flange,but the shape of the forgings decided that the parting surface is a hook face,can be seen from the figure 2,the C-C as shown in the surface is the parting surface,the forging direction is perpendicular to the parting surface,which is shown in the direction along the D - D.The machining allowance distribution that in this forging way is different from that of horizontal forging,with the draft need offorgings,so in the inside of the upper and lower fork,we need to add allowance,main parts as shown in figure 2 E, F sections.Thickness tolerance of forging is +/-1.5 mm,usually along the D - D to produce, wrong difference is +/- 1.5 mm,commonly perpendicular to the direction of D-D.